AMCRAN is governed by an advisory board. The Advisory Board is responsible for the long-term strategic direction of AMCRAN and to ensure that its activities are directed at achieving its goals. The Advisory Board consists of people who are respected within the Muslim community and who have a track record of successful community activism. For most activities, the function of the Advisory Board is much like that of the Board of Directors of a company. It provides strategic direction for the organisation. 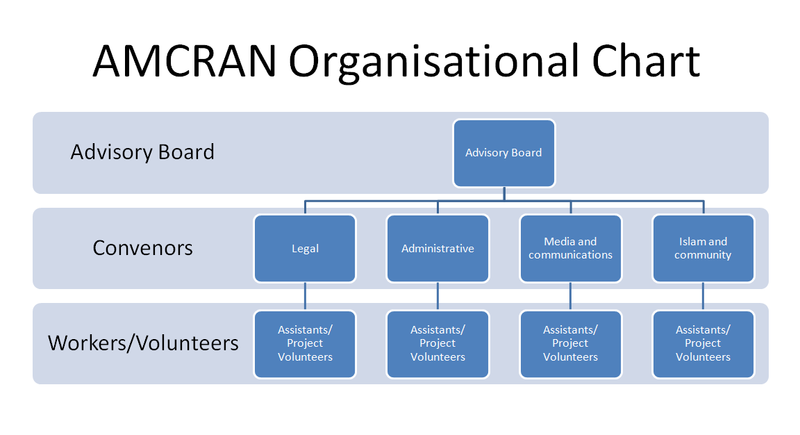 AMCRAN's activities are managed by a team of Convenors. Convenors have specialist roles and responsibilies and are accountable to the Advisory Board. The specialist skills required by AMCRAN may change from time to time to suit the need of the community. At present, there are three AMCRAN Convenors with these roles: Administrative Convenor; Legal Convenor NSW; and Legal Convenor Victoria.